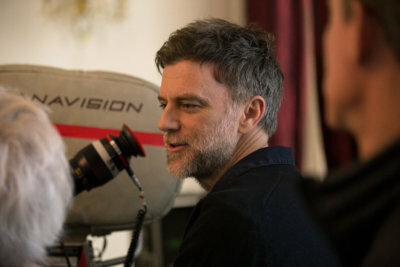 Paul Thomas Anderson is a director renowned for his eclectic work. Punch-Drunk Love (2002) is a romantic comedy concerning extortion and mass pudding acquisition; There Will Be Blood (2007) is an unflinching outlook on capitalism and greed. But his latest leap, from Inherent Vice (2014), a crime-drama set against the decline of the hippie era in Southern California, to Phantom Thread, a slow-burning, peculiar romance between a couturier and his muse, is perhaps his most ambitious yet. 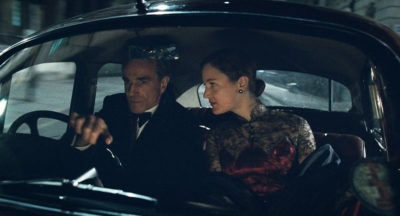 The film revolves around Daniel Day-Lewis’ character of Reynolds Jeremiah Woodcock, an haute couture tailor in 1950s London whose all-female clientele is as pre-eminent as it is particular: a Belgian Princess, an English Countess, and a fading American heiress (his clients are mostly “–esses” of some description…), all grace the threshold of Woodcock’s Fashion House. This cosmopolitan cast of characters provides the episodes that the plot is structured around; but Anderson’s lens is firmly focused upon the relationship between Woodcock and Alma (played by Vicky Krieps), a young foreign waitress. When she is selected as his latest muse, she is soon overwhelmed by the brilliant but twisted man who promised her such dizzying glamour. Phantom Thread’s genius lies in its acting. Daniel Day-Lewis provides a career-defining performance in his final role on the Silver Screen. As a character, Reynolds Woodcock is egotistic, fastidious, petulant, occasionally foul-mouthed and always averse to continental influences (on the word “chique”: “What does it even mean?”). But Day-Lewis not only captures the character’s idiosyncrasies; something as common as mourning is portrayed with a disarming tenderness. Woodcock’s plausibility lies in his refusal to be classed as any sort of “type” – even behind the archetype of the impassioned artist lies a feeble dependant. And Day-Lewis’ delivery of lines is only one element in a consummate manifestation of character – staring competitions, teeth grinding and flickering smiles humour and captivate the audience in equal measure. Perhaps unsurprisingly due to Day-Lewis’ historically awesome performances, Phantom Thread has been advertised as his film. Arguably, however, Vicky Krieps’ Alma is the lead here. Reynolds’ fascination with her implies a recognition of an unrealised beauty, which both empowers her as the inspiration for his work but also subordinates her into a passive mannequin. It is Alma’s traversing of the ever-shifting parameters of model and lover which provides the piece with its arresting tension. The power dynamics in this strange relationship are captured brilliantly by Krieps – at their first encounter, she is both embarrassed and flirtatious, obliging and reluctant. He is both “her hungry boy”, an image rich with maternal affection, and a deceitful collector playing an elaborate game with her. If Woodcock is the brilliant but neurotic intelligence underpinning the film, then Alma is its emotional magnet, navigating the insular interior of the fashion world with nothing but her fierce sense of self-worth to guide her. Her relationship with Woodcock’s sister, Cyril (Lesley Manville), an inscrutable, implacable spinster, is equally vaguely delineated. As with Alma and Reynolds, Manville’s character is multi-faceted; she is able to plausibly occupy the role of kindly supervisor to Woodcock’s employees, the indignant bulwark against Alma’s invasion of her brother’s private life, and yet a stern chastiser of the same man’s petulant outbursts. She also injects occasional humour; at Alma’s sexually-tense first fitting, she shuffles in and begins noting down her measurements with dry efficiency. That being said, the film suffers from unusual pacing in the first act. Apparently insignificant scenes sometimes feel over-extended – a bloating not helped by the sparse use of Jonny Greenwood’s (of Radiohead fame) rich score, which has deservedly been nominated for an Oscar. At 2 hours and 10 minutes, even the avid cinephile would be forgiven for occasionally glancing at their watch. 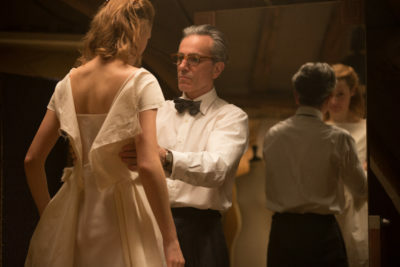 The eponymous phantom thread refers most clearly to the secret messages Reynolds leaves within the garments he designs; his own jacket contains a lock of his mother’s hair, a wedding dress the gothic-inflected “never-cursed”, and his first dress modelled on Alma her name. The phantom thread is what sows his artistic signature onto his work and makes it uniquely his own. It seems a fitting motif for a film rumoured to be Day-Lewis’ last; an actor whose every role contains hidden depths waiting to be discovered.